Elegant, sturdy, makes espresso and brewed coffee, better than Starbucks Verismo and Keurig: Nespresso Vertuoline 2in1 capsule machine. 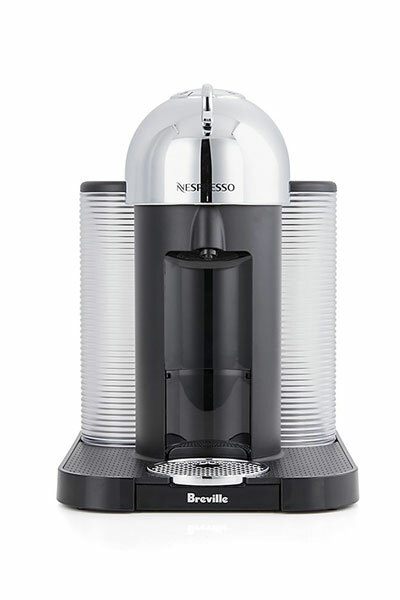 The Nespresso VertuoLine is a fun 2in1 capsule coffee machine from Nespresso. The machine can do espresso and regular coffee and has some really useful features! The machine is made of stainless steel and plastic and it’s quite elegant. It is nice and compact and it will look good in any kitchen. Compared to other machines with the same price tag, this machine feels pretty sturdy. On one side, there’s 40-ounce water reservoir which can be removed, so it’s easy to clean and refill. On other side, there’s a used capsule container. The container is also removable and can hold up to 13 used capsules. When a machine is done brewing and you unlock the lid, a used coffee pod will slide to the bin. The heart of the machine is its handle and a single button we use to brew coffee. The VertuoLine has an automatic capsule recognition system so you don’t have to change the settings for regular coffee or espresso. Just insert the capsule, close the handle and press brew button. The VertuoLine espresso machine retails for $199.00 ($249.00 machine + frother bundle). Its one button operation is absolutely amazing. As mentioned, the machine has an automatic capsule recognition so you don’t have to change the settings for regular coffee or espresso. Just insert the VertuoLine capsule, close the handle and press brew button. The machine will adapt the brewing process depending on what capsule you’ve chosen and ensure the perfect extraction. By default, brewed coffee capsule makes 7.7 oz, while espresso makes 1.35 oz. But you can easily adjust the volume manually just by pressing the brew button – stop the water flow early or add extra water to your cup. So easy. You can also program the water volume, and set the desired water volume for your coffee and for espresso, from 0.3 ounces up to 17 ounces! Once you program the machine, each time you make your coffee the water will stop at desired cup size. The system needs just 15 – 20 seconds to warm up and start brewing. Although, it’s a bit slow when brewing: needs 1:30 min to finish a 7.7 oz cup. In my opinion, the coffee tastes better than coffee brewed in Keurig or Verismo and thanks to its centrifusion technology the coffee will always have an amazing crema on top. Vertuoline machines work exclusively with VertuoLine capsules. Nespresso offers a choice of 10 regular coffee capsules and 4 espresso capsules – 14 total, including two decaf options. The machine does not work with Nespresso Original line capsules since they are different in shape and size. If you have a Nespresso machine from their original line, you won’t be able to use the VertuoLine capsules and vice versa. Price: $1.10 per coffee capsule, $0.85 per espresso capsule. Cheaper than Verismo pods and more expensive than Keurig k-cups. But, since you can fill a 17 oz cup with single $1.10 pod, this price is actually pretty good. Nespresso capsules are recyclable and the company offers a free capsule recycling program. You can not use k-cups, Verismo pods, Rivo pods or the CBTL pods in the Vertuoline machine. foil seals, My-cup cap and they also have a special kit for refilling Vertuoline pods. As for the recipes, Vertuoline allows you to make a huge variety of drinks. The Nespresso Vertuoline pods are more expensive than Keurig k-cups and there are not as many different pod options. You will also need to order them online. Nespresso has a recycling program for their pods so you can recycle them, while Keurig still offers only a few recyclable pod options. While Keurig k-Cafe makes a concentrated brew using regular k-cup, Vertuoline makes real espresso. Nespresso frother also makes better froth. Vertuoline does cost more, but you can usually score a good price on Amazon. The original like machines like Inissia cost less. The main advantage of original line is the fact that it offers 27 different pod options, at $0.70 – 0.75 per pod. The Vertuoline has 14 pod options and the price per espresso pod is $0.85. The main advantage of Vertuoline machines is the fact that they make espresso and brewed coffee, while Original line makes only espresso. All Vertuoline brewers include a limited one-year warranty for normal home use. Customer service help is available 7 days a week at 877-964-6299. It’s recommended to clean the external parts or the brewer regularly using a wet cloth and rinsing it once a week to keep it in a good shape. The system also has a descale alert feature and will let you know when it needs to be descaled. It’s recommended to descale your machine every 3 months. If you’re a busy mom or dad, but you still want a great cup of coffee at home, look no further. There are some good single serve machines out there, but this one is at the top of my list. You can make coffee, espresso drinks, it’s clean and super convenient.